Welcome to this month’s Blogorail Orange Loop. Today we are sharing vintage Disney attractions and entertainment and a little Disney history. When my great grandfather passed away years ago, someone set aside some early Disneyland memorabilia he had from a visit in the 1960s. Among the items was an early program and a ticket book, both of which I held onto because I had just recently discovered, well, how much I loved to read about all things Disney. The phrase “E ticket” is still widely used among Disney fans today when describing attractions, though the system hasn’t been in use in decades. When Disneyland first opened in 1955, there was a (very small) flat-fee admission into the park. Beyond that, each ride cost an additional $0.10-$0.35. In order to simplify things a few months later, the company introduced ticket books in October 1955. A guest could still pay cash admission for a ride, but most opted for the “Value Books” that provided not only value as the name suggested, but convenience. Originally just “A” through “C” attractions existed, but by 1959, the Monorail, the Matterhorn, and the Submarine rides would necessitate the introduction of the infamous “E Ticket Attraction”. The E ticket was reserved to let guests know an attraction was one of the best and most exciting the park had to offer. 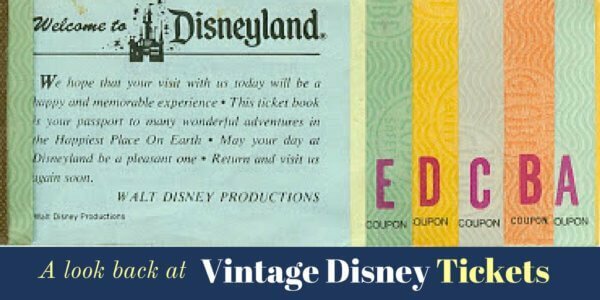 Interestingly, an attraction earning an E ticket denotation didn’t always mean it was thrilling as we may define it by today’s standards. Often in that time, the E ticket rides were simply the most advanced; from the earliest days of Disney animation to the floating mountains and greenhouse techniques Imagineers are working on at Disney parks today, the company has always been on the forefront of technology and innovation. 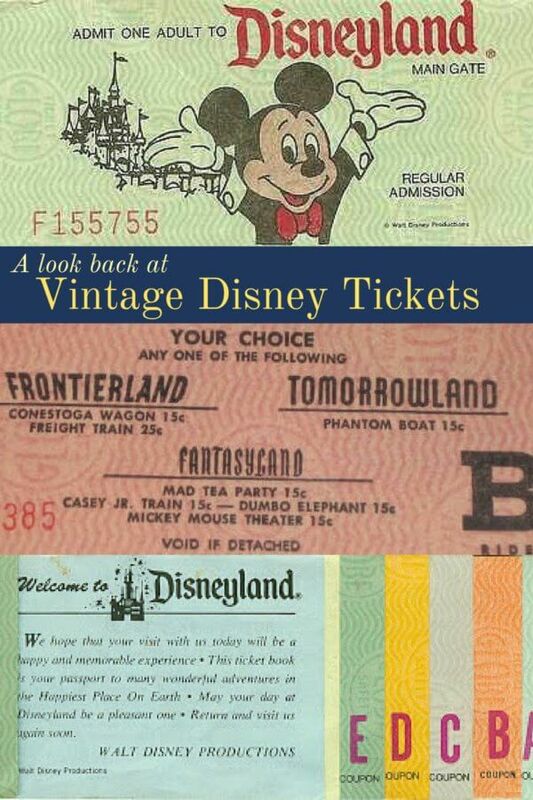 At that time, guests had two ticket book options. 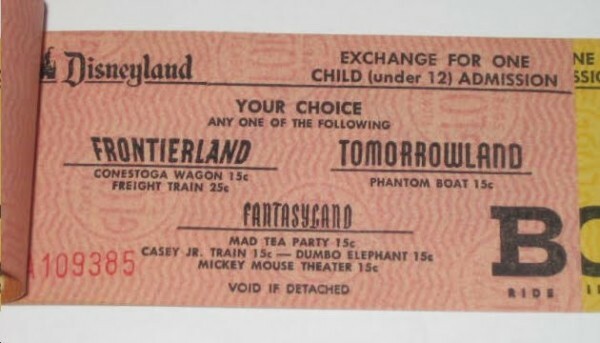 The 10-ticket Coupon Book, a $10 value and available for $4.95, contained one A ticket, one B ticket, two C tickets, three D tickets, 3 E tickets, and the general admission cost. A 15-ticket book had one A ticket, two B tickets, three C tickets, four D tickets, five E tickets, and admission. This pass was $5.95 per adult (valued at $12.95). Lower priced versions of the same books were offered for children and juniors. – When Sally Ride, the first American woman on the Space Shuttle, was asked to describe her experience, she called it “a real e-ticket ride”. – If you have a ticket book and aren’t sure when it’s from, there are a few ways to tell. The earliest will have expiration dates; that’s easy enough. Most of the later books do not have an expiration date, but instead have a three digit code on the back cover. The first two digits represent the year in which the book was purchased, and the last represents the month. – Books could be purchased throughout the park from ticket booths near the attractions; these booths are also where a guest would present their ticket to ride or pay the cash price. When we visit Disneyland, we love to look for booths that have blended into the scenery, or have been repurposed. Take a look at some here! – As time passed and/or new attractions were introduced, it was not uncommon for rides to be downgraded to a less-expensive category. Sometimes though, a ride would even get an upgrade in status! How would you have used your coupons? Every time I see the ticket books I wish I could add them to my collection of Disneyana. It’s not in the budget though, so I guess I will have to stick with my ticket book notepad! I think it’s very interesting that an attraction like the Carousel of Progress didn’t require any ticket at all. In my book, that would have been the one I would have done over and over again! I totally agree! And it was definitely unique even at that time. If only those prices were still valid today! I love that Carousel of Progress didn’t require a ticket. I would have been there all day! It’s one of my favorites. A fellow teacher at my school recently gave me a box of vintage Disneyland tickets that she found cleaning out her father’s house. They are so neat! One of these days I’ll find some time to get crafty with them. Oh I’d love to see what you do with them! I’m not even crafty enough for the idea of being crafty with them to have crossed my mind! 🙂 What we have isn’t super valuable or anything other than as fans, so maybe that’s the route we should go, too! I love looking at these. My mom told me that Swiss Family Treehouse was originally considered a ride. You had to take a raft over. If you look down now you can still see the original dock. Wow, I’ll have to look for that next time! Thank you for sharing. I was 8 years old when my parents took me to Disneyland (1979) and that was the type of book we used. I still remember going on the Dumbo ride, riding through Storybook Canal Boats and Alice in Wonderland waving at me during the parade as I was wearing a dress just like hers! Such good memories! Oh, how fun to have memories of such a different ticketing experience! I love your story about Alice too, because one of my favorite pictures is of my girls – and Alice – dressed as Alice 🙂 Thanks for sharing!